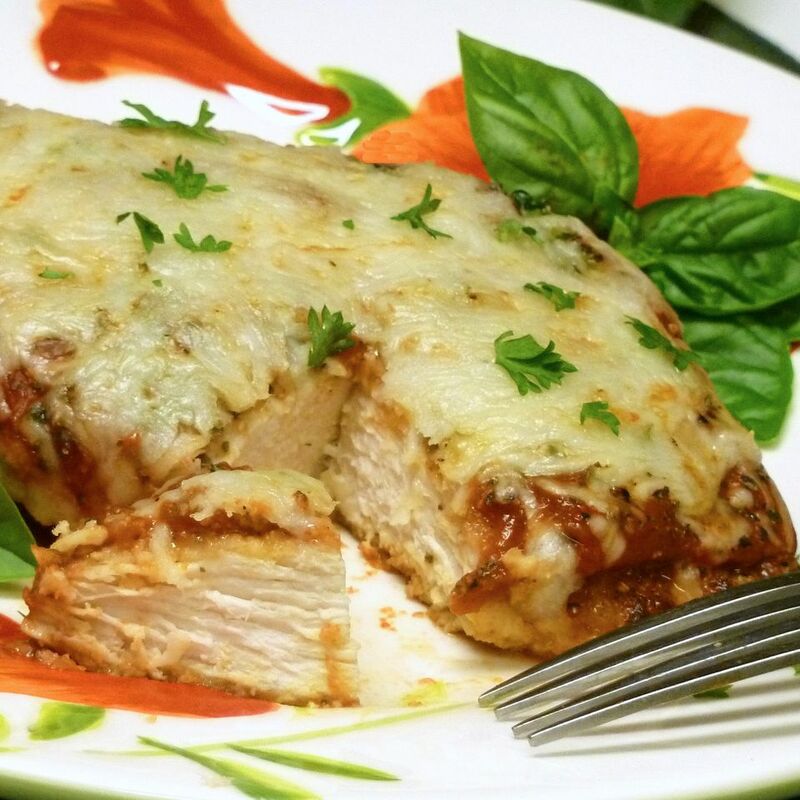 In this delicious and hearty riff on chicken Parmesan, chicken breasts are breaded, browned, topped with herbs, tomato sauce, and mozzarella cheese, then quickly finished in the oven. This homestyle recipe is quite easy to make yet makes a strong presentation for a casual dinner party. Do not skip the refrigeration step because it helps the crust adhere to the chicken. Dip the chicken breasts in the milk, then shake off any excess. Dredge the chicken in the breadcrumbs. Place in a single layer on a large platter and refrigerate for 30 minutes to set the crust. Spray a 9- by 13-inch glass or ceramic baking dish with vegetable oil. Spread one-third of the tomato sauce over the bottom of the dish and set the rest aside for later use. Heat a large, heavy skillet over medium-high heat. When the skillet is hot, add 1 tablespoon of the olive oil and swirl to coat the bottom of the pan. Quickly brown each of the chicken breasts, turning only once. Use the second tablespoon of olive oil for the second batch. Arrange the browned chicken in the bottom of the casserole dish, overlapping as little as possible. Spoon the remaining tomato sauce evenly over the chicken, then sprinkle with parsley, basil, oregano, garlic powder, red pepper flakes if desired, salt and pepper. Bake uncovered for 15 to 20 minutes or until the chicken is heated through and cheese is bubbly and slightly golden. Let the chicken mozzarella rest 5 minutes before serving.